Celebrations Magazine recently marked its two year anniversary, which made me look back on what a wonderful, fun and amazing, journey it’s been. I met Tim Foster from Guide to the Magic about 5 years ago, when he was walking around the MouseFest floor, quietly clutching his Guide to the Magic for Kids book in his hands – something he wrote, designed, printed and even bound himself. He didn’t know a soul, and when he came by my table and asked me to look at his book, I immediately ran over to my publisher’s table, pulled him aside and said, “Sign this guy! Now!” Well, Tim went on and self-published not just that book, but a number of books in the series. And from that first meeting, I also met a great friend. We talked for years about collaborating on a project together, and the ideas came fast and furious. And while (like Imagineering), no good idea ever dies, one thing that we continually spoke about was putting together a magazine. With the official Disney Magazine folding in 2005, many of us felt a void that was left by it ceasing publication. And although we’re in the age of the iPhone, iPad, netbooks, podcasts and other technological revolutions, we still love to hold something in our hands, see the photos, flip a page, and collect it on our shelves. But we knew we couldn’t (and shouldn’t) do it alone, and in order to put out the best magazine possible (one that not only we would be proud of, but that would hopefully live up to the expectations and standards that Disney fans have come to enjoy), we wanted to reach out to others in the community to contribute as well. We wanted to find people who were the best at what they did, and could contribute and share their passions with others as well. So we talked with people like Steve Barrett, author of the Hidden Mickeys Guide books, Beci Mahnken from MouseFanTravel, and eventually authors and historians like Jim Korkis, Ryan Wilson from the Main Street Gazette, Cast Members such as Mike Lyons and countless others (please forgive my inability to list and thank everyone here). I’ll never forget opening the folder and taking a look at some of the same pages from our first issue in early 2008. I was literally giddy, as I wanted to read it as a fan, as much as I was proud of it as a publisher. Tim became a regular on the WDW Radio Show, as our Top Ten (with Tim) segments afforded us the opportunity to work together and talk about some of our favorites in Walt Disney World in a fun, conversational environment. But in July, 2008, on Show #76, we had an announcement to make. With a deep breath, we revealed that for more than a year (maybe two? ), we had been working on a project together, and we officially unveiled Celebrations Magazine. The immediate response we received through emails and forum posts was wonderful and exciting, and in August of 2008, we went to press, and the magazine was officially born. Now to tell everyone else and wait and see what they thought about it…. I still have the very first email I ever received from a charter subscriber who described her reaction to the magazine. She was so excited that whether we had sold another issue or not, I felt truly proud of what we had put our names on, and that we were able to share our love for Disney with other people in this way. Of course, this magazine would not be possible without the amazing work from all of our contributors, and to YOU, the reader – so our biggest thanks goes out to all of you for allowing us to do what we llove doing so very much. I was reminiscing as we approached the two-year anniversary and was looking back at past issues. I laid all of them out on my office table one night, trying to choose which cover, and overall issue, I liked best. I was first able to narrow the field of twelve down to… well… eleven, and then ended up with three or four that I enjoyed for one reason or another.And that gave me an idea – I wanted to know (since I couldn’t decide on my own, anyway), what cover and issue YOU enjoyed most. More importantly, I was curious to know WHY. 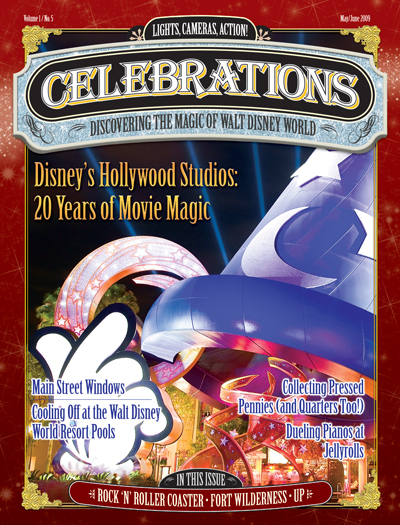 We will randomly select one comment posted from September 14 – 30, 2010 to receive a $25 Disney gift card, limited edition Celebrations Magazine pin, all FIVE Audio Guides to Walt Disney World AND a signed copy of Issue #1! What Cover of Celebrations Magazine is Your Favorite? Haunted Mansion all the way! For some people it’s the Castle, but for me, the Mansion has always been my favorite and that place in the “World” that when I see it, I know I’m there. No matter where I am in life, or what I’m doing, when I hear “Grim Grinning Ghosts” I smile. I have a special place in my heart for the first issue because I was just blown away by the Quality and Content of this new magazine! I have all 12 issues and cherish everyone of them but the first is my all time favorite! i picked issue 8, simply for 2 reasons. Fireworks. Illuminations. NUFF SAID. After spending 5 minutes trying to decide what my favorite cover is, I came to the conclusion that I should choose my favorite attraction. I love reading about all things Haunted Mansion and this issue helped feed my addiction! My favorite cover is from the very first issue: Cinderella’s castle. Why? Because it is a beautiful picture of the icon that best represents the magical wonder that is Walt Disney World. I want to say the first issue is my favorite. The castle is such an icon to the magic that is Disney and all of the Disney parks for me. With this issue, it opened up an opportunity for me to share with other readers 2 articles of two places I love when I go to the WDW resort. Thanks Lou and Tim! Happy Anniversary! I have to go back to issue 1. It was the first, and it was an amazing piece of work. I have been a subscriber since then, without a miss, and cannot get over how beautiful every cover is, let alone the contents. I almost hate to take them out of their plastic wrappers. I love the Main Street Electrical parade because it bought back great memories for me of our first trip to Walt Disney World. I like the music, the floats everything about it and can’t wait to see it again next month when we go back to the Magic Kingdom. I love the Wilderness Lodge Christmas issue – LOVE, LOVE, LOVE being at Disney during the holidays and the Wilderness Lodge is one of my favorite places to stay! Choosing my favorite cover is like choosing my favorite food, it’s almost impossible but I would say the WDW Railroad cover is my favorite, and the railroad article was just amazing, keep up the great work guys, in my opinion celebrations blows D23 out of the water! I love the Castle issue. It is such a symbol of Disney, the magic and feeling like a kid there. Since it is a night shot, it is also my favorite time of day at Disney. We grab dinner, then a seat for fireworks, look over the autograph books and play games while we wait for the fireworks to start. Great memories just looking at this photo! I think I like the castle cover the best for a number of reasons. That icon seems to embody for me the magic of WDW. When I first get to the park, seeing the castle for the first time always says “well you made it back to heaven on earth”. i can’t seem to take enough pictures of that castle whether they be blue, orange, violet or covered in goblins. My favorite cover has to be from Issue 9 of Cinderella’s Golden Carousel with Cinderella’s Castle in the background. On my last trip to WDW, I was able to get almost the exact same photo! I think with the carousel and castle lit up against the black backdrop of night gives the picture some pop. Absolutely love it! My favorite issue is Issue #4 specifically from the multipage article on my favorite resort – Port Orleans French Quarter! I loved reading the stats of the resort, background story, and the little details that people usually don’t often pay attention to. I can’t wait to go back in December! Only 85 days to go!!! Just a great picture of Miss Tilly. We have had so many great times looking up at Miss Tilly waiting for that next wave. 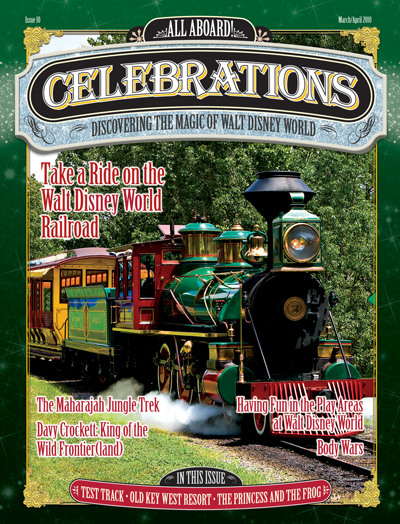 My favorite cover is Issue 10, the Walt Disney World Railroad. For me, the railroad really represents Walt, the person. It brings to mind the famous picture of Walt driving the train at Disneyland and waving, full of joy. Walt is the reason why we have Walt Disney World and because of his visions and dreams we get to celebrate everyday! Thanks again, Lou and Tim (and staff) for producing such a fantastic magazine! LOVE the Haunted Mansion issue. First, it’s an amazing shot tat makes the ride look just spooky enough, and Second, I love all things Halloween and this was a great dedication to the holiday! I chose the IllumiNations issue. 🙂 One reason is because the picture is just fabulous! Hard as I may try, I can NEVER get a fireworks picture to work . . . I love this cover so much even though it makes me so jealous. 😉 I especially like the reflection on the water . . . kind of makes it look like it is on fire, in a way! Another reason is because I have a large place in my heart for IllumiNations and it NEVER fails to make me bawl like a baby and, in turn, get the oddest looks as I am walking out of Epcot trying to compose myself. 😉 I have every issue, but this cover is, by far, my very favorite! Walt Disney World Railroad. My husband loves trains and the railroad is always a “must do” on our trips. The cover contains an image that is almost identical to one our son took on the trip we took right before the issue came out. I remember marveling at how similar the pictures were. The covers are all wonderful, but I had to choose this one for sentimental family reasons. I voted for Main Street Electrical parade. This has always been my favorite parade. I always come to Disney World on a Saturday and the 1st thing we do is come to Magic Kingdom and grab a spot so we can see the parade. While I save us a seat my hubby goes to Casey’s hotdogs and orders us a meal. We then munch happily waiting for the greatest parade in my eyes. Makes me feel like a kid again and oh yeah my hubby says I always have my mouth open in awe everytime I see the parade. Have a magical day and keep spreading the magic. I think issue #2 is my favorite because I love all the articles about holiday time at WDW. That’s my favorite time of year at the parks and resorts, and the more pictures, the better! My favorite is the Main Street Electrical parade because Elliot will always have a special place in my heart. I saw his movie when I was a child and I saw the parade as a child. They both still rock in my opinion! I had to go with the premier issue as my favorite as the iconic Magic Kingdom castle and the beautiful use of purple really makes the cover stand out and was definitely an excellent choice. My runners up would definitely be the Issue 7 Haunted Mansion followed by Issue 8’s awesome fireworks shot! I love the Cinderella Castle issue, it’s the epitome and icon of Walt Disney World and the one thing most people think of when thinking of the parks. A close second was the holiday issue, which is my favorite time of year, but the magic that is thought of when picturing the castle is just unforgettable. 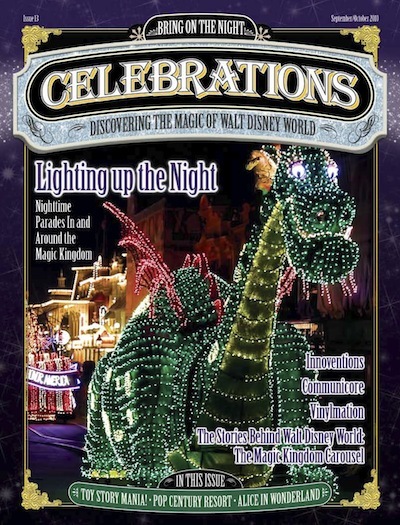 My vote goes to the Main Street Electrical Parade issue, though each issue is spectacular. This one gets my vote because I was there with my wonderful foster family who started my love of Disney when the original Main Street Electrical Parade first appeared and I was in awe. I grew up, went away and served in the military and had my own family, and years later I have returned this past summer to see it has returned. I was just as much in awe seeing it this year as I was the first time it rolled down Main Street. It brought me down the best of memory lanes and is my favorite warm fuzzy and issue. I picked the Fantasyland one. I just love the angle of it and there’s just nothing like Fantasyland at night. For me, the first cover says it all. Cinderella Castle. I was so insanely excited to hear about this magazine, as I love to get my hands on as much print about Walt Disney World as I can. This magazine is like nothing else I have read. The heart that goes into it is unsurpassed. I would take any issue of thie magazine over my D23 magazine – and they have a wonderful one too. (Proud D23 Charter Member!) I think Lou said it perfectly in his opening article in issue 1 – about that ‘Thing’ – that feeling that you cant put into words about Walt Disney World. Every time I am asked why I love DIsney so much, I want to pull out that article and have them read it. Thank you everyone at Celebrations Magazine for continueing to bring us all that much closer. Here’s to many many more years! I love the cover of issue #9, Fantasyland. I think it’s because most of my memories of Fantasyland are during the day. It’s usually the part of the Magic Kingdom that we want to visit first. However, I have some great memories of eating a late dinner with my family at Cinderella’s Royal Table, and staying inside for the fireworks. The backside view of the castle brings me back to that moment. I feel like Fantasyland at night might not get the credit it deserves. I love ’em all…but when pressed to pick just one, I chose #8 because it captures the overwhelmingness of IllumiNations really well. That show takes my breath away and the cover gave me goosebumps, which is probably the closest you can come in a photograph. Every cover, though, just gets us giddy to see what’s waiting inside! Congrats on two years! The photography on all the covers is amazing, but I love the Fantasyland cover (#9) most of all. I love all the parks, but I love the Magic Kingdom most of all at night. It seems to gain a sense of intimacy at night that allows me to not notice the crowds as much and really enjoy the experience as if everything was there just for me. Has it been two years already?!?!?! I have enjoyed providing content for each and every issue and appreciate all the compliments I have gotten for my “Wandering the World’ articles as well as my two articles I wrote before my current “beat” was forged (Victoria & Albert’s and Osborne Family Spectacle of Dancing Lights). I am very happy, appreciative, and grateful to both Tim Foster and Lou Mongello for asking me to be a part of this fabulous project. For me, who recently added two children into the mix in a short span of time, it has left less time for my blog, but I get to recapture the magic every time I sit down with my fingers on the keyboard typing out another installment for this fabulous magazine. I like the Train cover because, well Disney, Trains, it’s the best natural fit and I love riding the trains. I can imagine the smell, sound and feel of them just looking at the cover. Though I love many of them, I had to go with the old standby of Cinderella’s Castle. Mostly because it’s the perfect cover for the first issue. In addition to that it’s great photography and it looks even lovier at night. The Liberty Square cover and issue is my favorite because I am very patriotic. The pictures and articles about the things in the parks that represent our amazing country really got to me. It made me proud to be an American and a Disney fan. Thanks for 2 great years of pictures and articles. I hope that there are many more years of Celebrations Magazine. I don’t live close to Walt Disney World or Disneyland, so you help bring the “Magic of Disney” to me. Having just taken my son to WDW for the first time last November when he was 4 months old, and getting some great pictures of him and his mom in Fantasyland during the Fireworks at Mickeys Very Merry Christmas Party, I have to vote for the amazing shot of Cinderellas Carousel (I know the name changed but I am nostalgic I guess and loved show 176 – can I bring Jim Korkis home with to tell me bedtime stories about Disney nightly?) and the castle. I am now in the same boat as Christine above. Sigh need to come back from Fantasyland and to reality at my desk. Thanks for everything you all do. Fantasyland is my favorite!!! I love that you can see all the best of the land in one photo. It was a tough choice because they are all gorgeous! My favorite the Illuminations one because I love Illuminations. I chose Issue #1, like others, not because of the beautiful photo, but for the fact that’s it was the beginning of a great adventure, similar to walking under the railroad station onto Main Street on the first day of your visit. When I held the first issue in my hand, I wasn’t sure was in store for me; every page I turned brought new delights, akin to noticing something new on Main Street or finally spotting that hidden Mickey you know is there somewhere. It’s that way every issue, of course, but the first time, when you don’t know what to expect, is especially magical! The castle – The icon that represents Disney World. It was the perfect choice for the cover of the premiere issue. Awesome. I thought this was going to be easy b/c I was automatically going to vote for the 1st issue with the Castle – it is a beautiful picture of my most favorite sight at WDW. But then as I looked at the choices, I was drawn to the 2nd issue – the Wilderness Lodge Christmas tree. We are DVC members but the WL is not one of our home resorts. However, we’ve stayed at the VWL most often and it feels like home to us. Add in the spirit of Christmas, and well, it just makes me smile and sigh all at the same time. Looking at that cover also reminds me of how I felt when I first started receiving Celebrations. The 1st issue blew me away – the quality was (is) incredible – and it quickly took the place of the official Disney magazine in my heart. But when I received the 2nd issue with that amazing picture of the glorious Christmas tree at my favorite Disney resort, I just knew that we were in for a very special publication. This was not just a “one shot deal”. I was so right! Congratulations, Lou and Tim, on your 2nd anniversary – may we continue to Celebrate with you for many, many more years to come! Cinderella’s Castle – because I remember the excitement of receiving the first edition. I still get very excited with every one that comes through my door, but I can still remember thinking ‘It’s real!!! !’ when the first one arrived. Lou, have you ever considering putting a sample issue of your magazine online? I haven’t subscribed yet because I’ve never bought a magazine I haven’t actually seen. So: pllleeeeease? Maybe? Just one lil’ issue. C’mon. You know you want to. . . I chose Fantasyland. I simply love Fantasyland at night. It’s beautiful! OH MY! How can I choose? Each is special for different reasons…the trains, issue 10, are a beloved symbol, I love hearing the whistle as we stroll around the Hub. There’s the Haunted Mansion,issue 7, a truly favorite ride and a must do for every trip. IllumiNations, issue 8! The emotions are overwhelming! 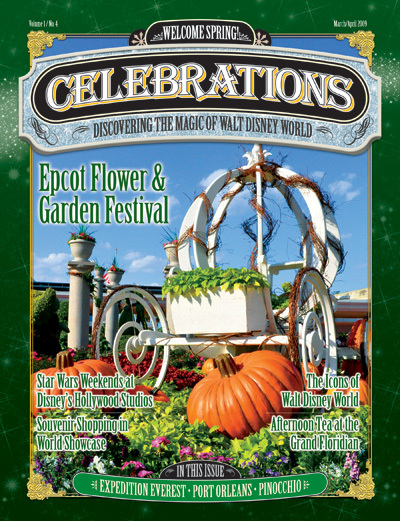 Issue 4 and the Flower and Garden Festival…one of our favorite times of year to go! But look over there, issue 2, it’s the Wilderness Lodge and the wonderful Christmas tree!! How can you vote against Christmas! And issue 13, with the Electric Light Parade, something we were lucky enough to experience ourselves recently. Tomorrowland! Fantasyland! Adventureland! LIberty Square! Typhoon Lagoon! How does one make a choice! My head is spinning…..and I look again, that very first issue….the one thing I must see first and last on every trip…how can I not choose…Cinderella’s Castle. Long may Celebrations continue to make it such a hard choice to pick my favorite cover, my favorite article….all about my favorite place! Thank you guys and congratulations on two wonderful years!!! Has to be the first issue. When you think of Walt Disney World, you think of Cinderella Castle. It evokes imagination, magic and dreams. It’s majestic. You just look at it and say wow. I loved the Adventureland cover because when I looked at the cover I could instantly hear the drums in my head and smell the pineapples of the nearby Dolewhip stand. 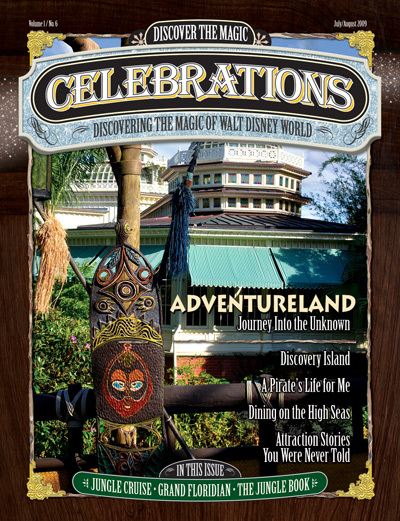 We always start our day with Adventureland so this issue’s cover conjured memories of the sights and sounds of starting our magical day in the MK! 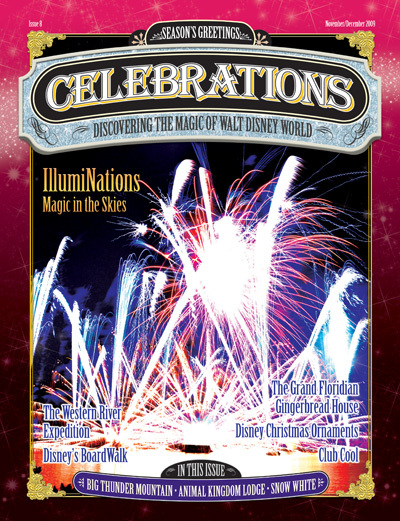 i’ve chosen issue 8 featuring the spectacular fireworks from Illuminations. The photograph is wonderful and captures in a single snap-shot the beauty and drama of my favourite night-time show in Walt Disney World. As a front cover, it draws you in to the magazine immediately, and just through the turn of a page, you are submerged in all the magic and fantasy that the Disney Parks have to offer. I’ve been a subscriber of Celebrations since day one and look forward to it arriving on my doorstep every other month. Living 4,000 miles away, I don’t get to visit the parks half as much as I would like, but your magazine allows me to indulge in a little bit of fantasy whenever the mood takes me! Thank you for all the magic Lou and Tim! I like the Illuminations cover, but they all are great. I’d like to see some food on the cover. Maybe that could be a food and wine issue. my favourite is fantasyland. I chose this because its a night time shot, so its all pretty! I love magic at night. The castle in the background all lit up and pink looks great. And no matter how hard anyone tries you willl always have an image of the castle when you think of WDW. I had 3 back issues shipped over to UK and loved it so much, I will now be a subscriber! My favorite cover was the Flower & Garden. I chose the Haunted Mansion issue because that is the BEST attraction (in my opinion) at Walt Disney World. 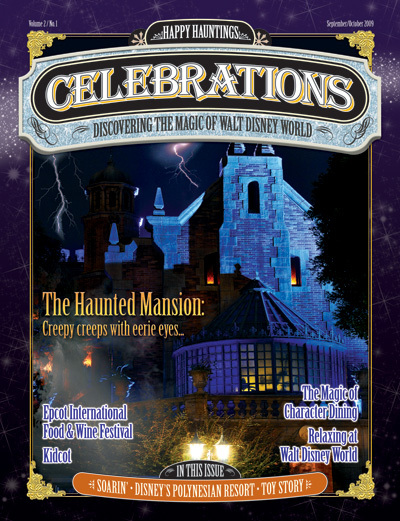 It was the best cover on Celebrations, and the best issue because of the article on the Haunted Mansion. I love the magazine and keep up the great work! Thanks!! 2) my favorite park during my favorite time year- sprig. Epcot is gorgeous with all the blooms…. Issue 1 NO NO NO! the Wishes issue…WAIT! the Miss Tilly model….too hard to choose just one. Ok, my love of trains has forced me to choose the Train issue. I miss the train that ran through Fort Wilderness. All were great covers though. This was like choosing your favorite child 🙂 congratulations on 2 great years of Celebrating Disney magic! I love the cover to #8 because it captures the majesty of Illuminations and, in a different perspective, the brilliance and joy that is Walt Disney World! I love all the covers, but I picked Haunted Mansion because it was the cover that got the most reaction from my family when we saw it. We had to play rock/paper/scissors to see who got to read it first! Thanks for all you do. We love this magazine and love the podcast. I love the Tomorrowland cover the best, though it’s tough to pick! The Tomorrowland re-design is absolutely one of my favorite re-workings of an area ever, and that cover captures the amazing detail and artistry of that whole land. It is so hard to pick just one! I am partial to the Fantasyland picture. Seeing the carousel and the castle makes me feel…peaceful. Like I am a child again, with no worries or burdens, and I can get lost in the beauty of the lights and the music of the carousel and the magic of the castle. Best one is the Haunted Mansion. There is something about doing the Haunted Mansion at one in the morning during the extra hours. It really is hard to pick just one! But I LOVE The Main Street Electrical Parade so much, especially the Elliot float! It is not an easy task to get a photo of that parade, and that photo is gorgeous! So, that is why it gets my vote! I really like the Illuminations cover (issue 8). A picture that can capture a moment so well that it transports you to a moment in time will always be on my favorites list. In this case that moment is my first time seeing this spetacular show. It is, by far, my favorite. The railroad does it for me. It is the first thing you hear as you enter the Magic Kingdom and the last thing you hear when you leave. It tells me I have arrived and I have no worries in the world. A smile crosses my face and I’m 8 years old again. It has to be Cinderalla’s Castle. It is an icon for WDW and the Disney movies. There is nothing that says WDW to me like the Haunted Mansion. From the headstones at the entrance to the ballroom, the graveyard and Little Leota, this attraction has a timeless charm that never grows old. I have been reading this magazine since the first issue and it was a hard choice, but after looking at each of my own copies I have chosen…. The Haunted Mansion. Not only is this my second favorite ride (Pirates is #1), but I love the facade of the attraction and this picture perfectly catches the Mansion at night time… I LOVE IT!!!! The Richard Sherman interview was just wonderful to read, and the interview was also amazing on the WDW Radio Show as well. Keep writing the magazines, Lou & Tim! You are both so talented and amazing! It is hard to pick my favorite, but I choose Cinderella’s Castle. It is a wonderful picture and I was so excited to receive my first issue! Although, to tell the truth, I am excited to receive every issue 🙂 Great quality product, Lou & Tim. Best of luck for many more years to come. Love the magazine! I have to put my vote down for the haunted mansion! I love this attraction. I tried to get a copy of this issue from you at the Pacific Northwest Mousemeet, but you didn’t have any copies. Can’t wait to get a copy. Go mansion!!! Loved them all but my all time favorite is definitely the Premier issue was in awe of the QUALITY and QUANITY of CELEBRATIONS!!! takes me at least 4 days to read it as I read it at the table and use the white address paper for the quizes and to keep my place and to keep finger prints off if im eating breakfast etc. already looking forward to my next issue with the start of the 3 yr!! GREAT MAGAZINE GOOD WORK everyone!!!!! You can never go wrong with the Castle lit up at night. It’s so magical and it’s the symbol of WDW! Brings tears to my eyes of all the fabulous memories and dreams of great times to come! Love the haunted mansion picture…. Hey will the “out of print” issues ever be avilable again? I voted for Issue #3, Tomorrowland just because I love this shot. I have always tried to get a good pic of this myself. All the photographs in the magazines are incredible and I really appreciate the shots I can never get like this one. The whole Tomorrowland them is so appealing to this child of the space race. I especially love it at night. Keep up the great work and congratulations on 2 years. I had to vote for the Main St. Electrical Parade cover. The composition of the shot is well done with both foreground and background elements. The exposure also is well done – and that’s not an easy parade to shoot. I vote for Cinderella’s Castle it is a reminder of Walt Disney World. It is a Icon of the Dream’s of Walt and how he has changed our whole cuture. It is a reminder that our dreams can come true and that we only have to keep dreaming. Disney has created so many happy memories for millions of families and their children. Dreams of vacations that they will always remember and happy thoughts every time they think of it. That is what keeps people coming back. The people that work there. There are tons of theme parks out there but only one treats the people that come to their park with so much respect and are so helpful. Customer service is so crucial and Disney is the best. Keep up the good work disney and keep making wonderful movies and rides. Keep up the good work and keep moving forward! So many to choose from! But from a personal perspective, I choose #8, Illuminations. I can’t think of a better way to end the day at Disney World. My favorite and most treasured issue is “Issue 2 – Wilderness Lodge Christmas Tree.” Christmas at Walt Disney World is the most beautiful, magical, and tear-inducing time of the year! 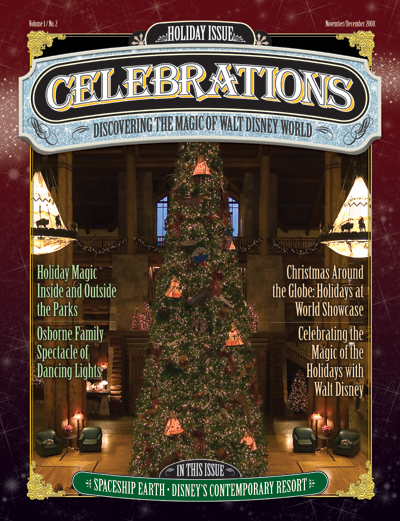 This issue is the ultimate guide to the holidays at WDW. The cover pictures the most Christmas-y of all the resorts, the Wilderness Lodge, so that gets the issue off the the perfect start. And the photo on pages 38-39 of the Lights of Winter is all the more of a treasured keepsake now that that most wonderful of all holiday attractions seems to be gone. 🙁 Thank you, Tim & Lou, for your incredible magazine, and especially for this amazing issue! The night view of beautiful castle evokes a magical feeling. To many of us, It is the symbol of Walt Disney World and brings back happy memories, just to see a picture of the castle. My selection is issue #1. Thanks for the chance to win some very nice prizes. I love the Wilderness Lodge Christmas Tree on Issue #2! The Wilderness Lodge is like my second home. That picture inspired me to book my trip during Christmas of ’09 because I wanted to see the tree so badly. And it was grand indeed! I loved the first issue; I was so excited to get my first copy! It’s great to have a Disney fan magazine out there to give those of us who live so far away a little bit of that pixie dust to brighten up our days and help give us our Disney fix. Thanks for the great magazine! I was so happy to see that my Christmas tree made the front cover of your magazine. Having stayed at the Wilderness Lodge the previous Christmas through New Year it brought back wonderful memories of our first Disney Christmas and how great it was to start the New Year in Disney style. I just realized that I DON’T even have the first 3 issues….OMG!!! Gotta fix that, but my favorite from the rest is HAUNTED MANSION because I loved the details about the ride, and the great info about the Food & Wine festival which I have not been to yet! Great cover pictures are always enjoyed…but the Haunted Mansion issue highlights my favorite attraction. Keep creating the magic for us to share! I had to pick Main Street Electrical parade – love the pic of Elliott first off, I missed him so much! Besides, to me this was the “big” issue for ya’ll – the one that showed that you had worked out the bugs, could figure out this magazine thing and keep it going for so long already! I’ve subscribed from day one and I’m so glad for you guys! Thanks for putting a little more magic in my life! I’ve always had a special fondness for Liberty Square. I love the old tree, the bell, and stil love the Hall of Presidents. They might not be the most popular things at Disney, but they make me nostalgic. Hard to decide (between No1 and No8) … but I decided to choose No 1. Cinderella Castle is forme the symbol/icon for Disney World. When I see this beautiful castle, I know, I’m back home to my WORLD. 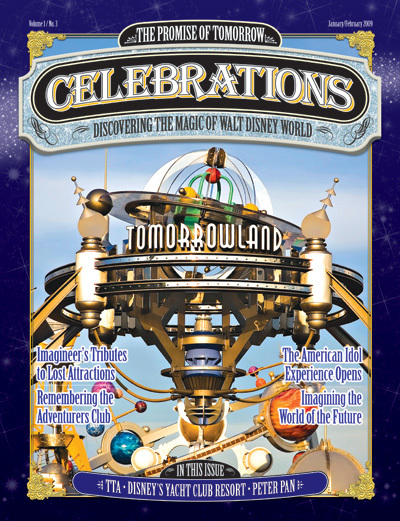 The Tomorrowland Issue is Walt Disney World! All of the ideals held by Walt Disney, including foundations for his Dream of EPCOT and Progress City began with Tomorrowland. It’s a mini world’s fair inside a fantasy world, next to a larger permanent world’s fair. The articles are well-researched, paying tribute to past attractings as well as the importance of staying relevant in today’s world. The photos are stunning, and original in perspective. 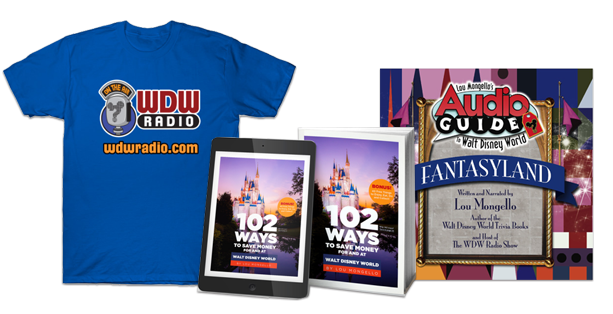 It is a fine project on it’s own, but is enhanced by an association with WDW radio. Issue 13 – MSEP was my favorite. I love every cover of every issue, but since MSEP is finally back at WDW, I had to go with that one. When I was on my honeymoon 11 years ago, we waited on Main Street for the parade only to have the clouds open and it rained like you would not believe. We didn’t go back to WDW for several years and by that time, the parade had moved to the CA. When I heard that MSEP was coming back to WDW, I cried. I was like a kid and was very anxious to see it. MSEP did not disappoint. All of the issues of Celebration Magazine are informative and have the best stories. Everyone who contributes to this magazine should be very proud of their work. I picked Issue #8 Illuminationas cover. Illuminations is something that has always been meaningful for me. It was something my parents and I always made a priority to see, when I was younger. My mother passed away in ’03, so I have great memories of watching Illuminations with her. This past January, 1/24/10 to be exact, I was on vacation in WDW w/then boyfriend. He said he wanted to take care of details of first night of our trip, I was excited because I’m always the planner. He booked Bistro de Paris for dinner, knowing neither of us had ever been. It was fabulous! Then we went to get a great spot for Illuminations, right before the show started, he pulled out a box, got down on one knee, expressed his love and asked me to marry him. Of course I said yes! And of course we are planning a WDW wedding, and we sure will see Illuminations w/our and guests and again when it’s just us on the honeymoon. Cinderella’s Castle is the quintessential focal point of WDW and it is a beautiful photograph of it! I really like all the issues, but I really like Issue #13 Main Street Electrical Parade. Its an iconic Walt Disney parade and it really belongs in WDW and I am glad to see that its back. The castle has always been the thing that says Disney World to me. I loved the Haunted Mansion Issue the most because we got to learn a lot of cool and interesting facts about one of our favorite attractions. I had no idea about many of the cool facts in this issue. The issue also talked about Toy Story (one of my favorite Disney movies) and Soarin’ (one of my favorite attractions). I picked the Christmas tree issue as the last time I was there was around christmas and the parks and hotels have the extra magic added at that time of year and that cover puts me back in the magic of my favourite family vacation. Thanks for all the issues guys, we all appreciate the hard work and effort for a magazine I look forward to and limit my daily time when it comes so it last longer. I voted for Issue #1 – the iconic castle. A beautiful picture that makes me wish I could step right into the magazine and be at the happiest place on earth. Fitting because while I’m reading Celebrations magazine I am there in my mind’s eye. The Liberty Square picture is a great one, and it’s place at the heart of WDW just speaks to me. Yes, Illuminations is my favorite thing to see in all of the WDW parks, and I do love the Tomorrowland picture as well, and the Main Street Electrical Parade is a wonder. But if I had only one of these covers to put in a frame and hang on my wall, it would be the Liberty Square cover. Issue 2. My Family loves Christmas and this cover sums up the feeling that we wish could last the whole year long. I love the Wilderness Lodge and the PNW theme as well. The last visit we had to the World was during the Holiday Season and my oldest son, who is now a teen, shall remain stuck with Goofy singing Christmas Carols in his head for the rest of his life! Issue #1 and its so simple. The castle is the wennie that takes your breath everytime. I loved the First Issue because I knew I had found the magazine that would take me ‘home’ every issue! And every month the magazine has NOT let me down! Keep up the magical work to all of you on the Celebrations Staff! And thank you for helping to spread the magic!! I have to say I’m partial to Issue #13 because I know the guy who wrote the cover article really, really, REALLY well…haha! Seriously, my favorite one other than #13 is the one with the Wilderness Lodge Christmas Tree. It’s a nice reminder of my favorite recent trip, December 2008. I picked Issue 8 “Illuminations” because that is one of my favorite things at WDW!! This is a tough choice as so many of the covers are simply striking. However, I agree with the earlier post by Emily B. Adventureland is my favorite. It is the cover I was first drawn to and it is the one that evokes the most emoitional response for me. Some of the other pictures are perhaps more beautiful, but the Adventureland photo almost transports me there. I too can hear the drums in my head when I look at it, and Dole Whips quickly come to mind. Crossing that bridge into Adventureland is a part of the Disney experience I never tire of. WIth out a doubt, it has to be the cover of Issue 2 – the Wilderness Lodge Christmas tree! The WL has such a sentimental spot for both myself and my wife and is our favorite out of all of the parks – especially during the holidays! The lobby is so warm and inviting, yet soothing and relaxing at the same time. I am not sure if there are more comfortable chairs anywhere else on WDW property which makes people watching so much fun! The restaurants are some of the best with Artist’s Point being my wife’s favorite on property! Definitely issue 2! Issue 1 – Cinderella Castle. Perhaps the obvious choice, here. It’s clearly one of the most recognized icons around. When my son made the connection to the castle on the Disney DVDs to World Disney World it took me back to Sunday nights as a boy in front of the TV making the same connection. It’s truly magical. I picked the first issue with Cinderella’s Castle. The cover reminds me of a poster that hung in my room growing up that I got on my first trip to WDW when I was little. It was a night shot of the Castle taken from Main Street with all the lights in the foreground. 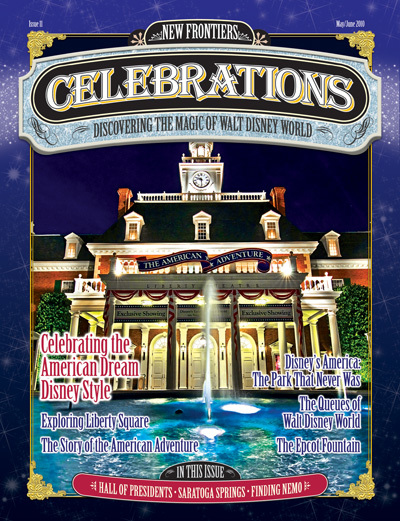 Each time I get a new issue of Celebrations it takes me back to that first trip and reminds me all over again what a special place WDW is and how much I love it. Congrats on the magazine’s success! Tomorrowland has always been one of my favorite places. The designs are timeless! I voted for Cinderella’s Castle. I love walking down Main Street and viewing the castle up ahead. It’s when I do that that I know I’m back at my happy place. Next year, when I take my daughter for her 1st trip it’s that view of the castle I’ll be waiting for. I’d have to go with the tomorrowland cover. It is really a fantastic image taht captures the feel of the new tomorrowland style. 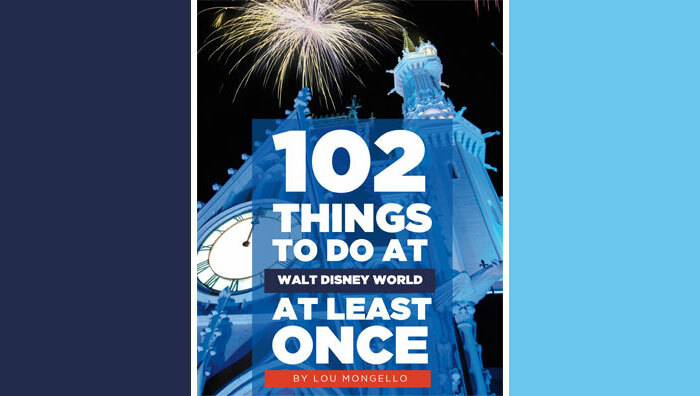 Cover #9 is my choice not because it depicts my favorite attraction or memory of Walt Disney World, but because it embodies everything Lou and Tim have set to do since the beginning. People all over the world relate Cinderella Castle with Walt Disney World, but they often times fail to acknowlege the detail and history of this wonderful place. By showing the carrousel as the focal point, as opposed to the castle, the cover tells me that there are other things worth acknowledging. The carrousel immediately reminds me of Jim Korkis’ in-depth discussion regarding the history of this classic attraction. Without WDW Radio or Celebrations magazine, how would I have ever known that this attraction originated in another theme park, or that all of the horses are hand-made, or that the horses have names based on their position? This is why I tend to gravitate toward this cover. Lou and Tim have truly opened my eyes over the last few years. When I saw the cover with Cinderella’s Castle on the first issue it took my breath away. I knew that this stunning picture was just the beginning of a fantastic magazine! Main Street Electrical Parade is my favorite. The dragon takes me back to my childhood many years ago. Issue 1, Cinderella’s Castle. It reminds me of everything wonderful in Disney World. It’s classic, like a Chanel suit, it never goes out of style. It always reminds me of all the memories I have visiting Disney. There can be no better cover, it represents everything special about the wonderful community Lou and Tim have created. Thank you for everything you do to remind of us of the magic! Your work helps to keeps us moving forward! By far the first cover, Cinderella Castle. You chose the absolute icon of Disney to launch your fantastic magazine. Every time I see that cover it just awes me. As all of the covers are great, I have to go with what would I pick up off the table with just a quick glance. Cover #1, Cinderella’s Castle will always mean Disney and a very happy place to me! Although I have not received it yet, my favorite cover is from the newest issue featuring the fabulous Main Street Electrical Parade! This has been and I believe will always be my favorite parade and I look forward to the day it comes home to Disneyland! I love the Haunted Mansion cover. That is a great picture. Not only is the cover awesome but the articles in that issue appeal to me and my personality. Epcot Food and Wine Festival, Soarin’, Polynesian Resort, Toy Story, man what a sensory overload. I love it. This is a tough question. I have three favorites: 1). Haunted Mansion, 2). Mickey’s sorcerer hat in Disney Hollywood Studios, & 3). Typhoon Lagoon. But I guess, seeing as I have to choose, I will go with the Haunted Mansion. Cover is cool and the article was great. Plus, it’s my all time favorite attraction! Nothing describes the magic of Walt Disney World better than the majestic Cinderella Castle… and the photo on the inaugural issue captures it well. Beautiful. To me-the castle IS Disney-and a Celebration!Thank you for both. My vote is for Issue #1 (Cinderella Castle)! It’s the Premiere Issue, so you can’t get any better than that. Plus the cover features Cinderella Castle; it’s ICONIC! How do you not think of Walt Disney World when you see Cinderella Castle! It’s just beautiful! Cinderella’s Castle is the symbol of Walt Disney World, for me, and this picture captures it beautifully. My choice was number 8. Eventhough the Castle is the major icon I just love fireworks. The excitement of being able to see fireworks everynight out weighs the castle for me. I see to be in the minority but I loved the Typhoon Lagoon cover. The water parks have such incredible theming and it really sets them apart for the competition. Although I think the issue with Cinderella Castle is stunning, the Disney Hollywood Studios cover tugs at my heart. In 2003, my son was diagnosed with severe autism and he was three. We were standing right in front of Mickey`s Sorcerer`s Hat and Andrew was in his stroller and too shy to get up and greet Sorcerer Mickey. I was crestfallen because he so loves Mickey. I was gettting ready to give up and bent over to tie my son`s shoelaces when a shadow was cast over us. I looked up to find Mickey doing antics with my son and was successful with getting a response out of Andrew. Mickey had Andrew laughing and covering his eyes playing peek a boo…..and again, my son has severe autism. I cannot ever put into words what that moment did for me and my family, the hope it gave us for the future, and now we keep on believing that someday my son will recover. Thank you Sorcerer Mickey….a memory of a lifetime and hope for the future! Haunted Mansion. The lighting, the fog and the angle of the picture capture the eerieness. All are fantastic but the Wilderness Lodge will always tug at my heart. Had some of my best trips to WDW staying there and to be there at Christmas is even better. Keep up the great work!!! I absolutely adore the picture of the christmas tree in the Wilderness Lodge. The picture captures not only it’s extreme beauty, but also the ambience and emotions that come from spending the holiday season at a Disney park. My vote goes to the Premier issue – Cinderella’s Castle. I was just starting to get the Disney bug and reading, watching and listening to anything I could get my hands on. I was already a fan of the Lou’s podcast and trivia books, so when Tim and Lou announced the magazine I immediately signed up. Words can not explain how excited I was when the first issue arrived in the mail. It is just a great magazine and everyone who contributes should be proud! Thanks for the outstanding publication! PS – when are we going to get a iPad readable version? Although all of the covers are wonderful, I have to vote for issue #1. Cinderella Castle means Walt Disney World to me, it’s the sign that we’re finally back home every time we visit the world. We’ve recently subscribed to Celebrations, and eagerly await our first issue! Haunted Mansion! This is one of the most celebrated attractions at the Walt Disney World Resort. Walt himself was very specific about how to make a “haunted house” attraction without losing the family-friendly feel. It really is the details that set this amazing ride apart from so many others. It truly is magical when you see the various spook and specters in the ballroom scene, or when you hear Madame Leota calling in the spirits (“wherever their at!”), or when you sing along with the busts in the graveyard scene. While there are a few things that have changed in the Haunted Mansion over the years (Madame Leota’s “living” grave, the addition of the stairs, and the addition of Constance in the attic), the magic has stay intact and the genius of Walt Disney lives on, indeed! Everything Disney has some sort of childhood memory tied to it for me, some are still found in the parks and others are long gone. But when the Main Street Electrical Parade returned this year it was like a blast from the past! So a couple of months ago when I got to sit down and watch the parade for the first time in so long, it brought back great memories. This is why I had to vote for the cover with the parade on it! Hi I chose the tomorrow land cover. it is my favorite land in the Parks, and I just love the energy htat is there at night, the TTA is awsome and Space Mountian rocks, The Astro oribitor is so fun at night, and I love the Carousel of Progress. My eye keeps going back to the Illuminations cover! Although, you really have done an outstanding job with all of them — I can’t even begin to tell you how giddy excited I was to learn of a new Disney magazine. It has certainly not disappointed me in any way, shape or form. Love it, love it, love it! I love the railroad cover. Walt loved his trains. The train on the cover is the Lilly Belle I believe. That train is named after Walt’s wife and is also a tribute to Walt’s early train he ran in his own backyard. To me the train cover is just so much more than a train. Voted for the first , it was the start of great things to come. I love all of the covers, but the very first one with Cinderella’s Castle just gets to me everytime. It’s just something about that castle that calls to me every time I see it; whether it is in person, on tv, or in a picture. To me, it is the epitome of magic and dreams. I asked my 8 year old son to help me pick because I love many of them. We decided that issue 8 with the fireworks was our favorite, but we (as we have learned from Lou) have many honorable mentions. Now, go with me here – Issues 1, 4, 9 and 13 were just to good not to mention! I love all the covers. It was so hard to decide but I finally went with issue #2 – the Wilderness Lodge Christmas Tree. I just love the Wilderness Lodge and they way they decorate for Christmas is absolutely beautiful. There is something about being at that resort at Christmas that really puts me in the Christmas spirit. This was a tough decision for me! I narrowed it down to issue one and issue 5, and ultimately decided on issue #5. While I am not a huge fan of the “hat” at Hollywood Studios, this picture just makes it look like the coolest thing ever. It captures the magic and fun of the Studios, and has a WOW factor that make me want to pick up the magazine and inhale everything inside of it. Now, I need to order at least one of your magazines, but I am hoping I will win the drawing! Thanks for a wonderful podcast that inspires me week after week! First off, I’ve been a subscriber since the beginning & I love all covers. I chose Tomorrowland because it’s such an iconic piece of WDW. I have great memories from my first trip to the World when there was no Hollywood Studios, Animal Kingdom, EPCOT, etc. Tomorrowland was like nothing I’d ever experienced before & I still love to visit there & explore the old and new. Thanks for a great publication! I chose the second issue wilderness lodge Christmas tree. Why? Because I love Christmas at Disney. This issue led me to my first trip during the holidays. Thanks guys for all your hard work. I voted for the Haunted Mansion issue since that is my favorite ride at WDW. I love this magazine and I really enjoy looking at all of the pictures. Because of all the changes that have happened to the land tommorowland has always been my favorite. To see how the cover captued the Tommrowland Sign in the Jules Verne just blew me away. My favorite, although I knew it would not have many votes, was the cover for Adventureland. Adventureland is my favorite land in the Magic Kingdom. I feel that it is the most immersive of all the lands. As you walk over the bridge, the vegetation turns more lush, the wonderful drum beat music is piped in over the speakers, the narrow (relatively speaking) walkways that literally surround you…LOVE IT! I usually head over first thing in the morning and, similar to the AK park, you get that humid feel and sometimes you can still see a little bit of mist hovering in the vegetation. Could stay there all day! Cinderella,s Castle just is Disneyworld for me. That first issue had me hooked on “Celebrations” & I have every issue sinse & never tire of looking through them. The first cover photo sums up Disneyworld, its Magical,Beautiful & just like a Fairytale………………even though living in the UK adds to the cost of having them sent over…………………………..its so worth it to get my Disney-Fix. Thanks to everyone concerned with Celebrations……………..fantastic jobs all. Issue #11 – Mostly for personal reasons. It was the first issue that I recieved and it is the one I think of when someone mentions Celebrations Magazine. The castle. Come on – how can you NOT be happy when you see that picture! Main Street Electrical Parade is Back! Bringing back the MSEP instantly took me back to my childhood. Of course, the coverage of the parade in Celebrations Magazine left me remembering sitting on Main Street, marveling at the lights and music. Now, I can’t wait to share it with my own child. I chose the Haunted Mansion cover because I’m 17 years old and that ride still makes me want to pee my pants. I picked Cinderella Castle as my favorite. My reason, its iconic. You see it and you know what it is and where it is. The castle represents anything that is Disney. And you can pretty much guarantee that anyone that has visited Walt Disney World, has a picture of it. I picked #2 because the WL tree says, “Welcome home for Christmas!”. It envokes the warmth of home, and that is what WDW is to so many people. Main Street Electrical Parade – two memories. Memory #1 – It was my first trip to Disneyland and I wanted to see the MSEP. My aunt who had a migraine headache wanted to go home early. So my dad took my aunt home then came back to the park (a 2-hour drive) in time to sit with his baby girl and enjoy the MSEP. This is one of my fondest memories of my dad, who passed away 11 years later. Memory #2 – Twenty three years later, I was 2 months pregnant with my daughter and this time at the Magic Kingdom to once again watch the MSEP. At first I was all smiles and then it hit me – the deluge of tears. On the one hand, I was so happy to see my favorite parade while remembering that great moment from my childhood. On the other hand, I was so sad because I missed my dad, knowing that the baby girl I was carrying would never get to meet him and make any lasting memories with her grandfather. My husband held me as I bawled and watched those beautiful floats pass by. I am happy to report that although I haven’t seen the MSEP with my daughter yet, we have experienced so many other wonderful “magical” Disney moments together. We love being in the parks as a family and I feel in my heart that my dad is always there with us. The very first issue. It just brought Disney home. I like the Main Street Electrical Parade. It is sort of an anniversary to have that back at WDW and it is Celebrations Anniversary. I absolutely love the photo and article on the American Adventure pavilion. Something about the building lit up at night is truly magical. I also enjoyed the part about the Voices of Liberty, as they are my favorite live musicians in the parks. I love Illuminations, and I also love Halloween time at Disney World. Basically everything about Disney is great so I really cannot choose. My favorite is the Wildnerness Lodge’s Christmas tree. It was the first issue I read and it reminded me of the time my family watched the staff put the tree up. TomorrowLand. Fantastic picture. Embodies the Essence of Imagineering: Imagining the World of the Future. The future of our children, which my 12 y.o. hopes to contribute to by leading scientific & space explorations and help establish future cities in space and/or other planets. I chose issue 3 because I love Tomorrow Land and I have been trying to get that same photo everytime I’m there but never looks as good as that cover. I like the new look that Tomorrow Land has this photo captures the look and feel very well without all the clutter in a photo that you could get when taking photos further into the land. The picture of Cinderella’s Castle on the first issue is my favorite. To me, Cinderella’s Castle is Disney World….it’s the very thing I can’t wait to see on our first day in the Magic Kingdom!! The cover I wanted to vote for wasn’t listed, I would vote for Issue #100. What a landmark that will be for all of us who have come to love and treasured this magazine. In it’s place (like Beth) I choose #10 (a relative of 100) for it’s association to Walt Disney. “It all started with a Mouse” may be the adage of the Disney Company, but for the true Disney Fan a more fitting motto is, “It all started with a man.” And that man was Walt Disney. His love of the Railroad is well documented in this issue and in the WDWRadio podcasts. No trip to WDW, no “Celebration” is complete without a trip riding along the rails on the train. It encircles the Magic Kingdom and celebrates his original vision, a place where both children and adults could enjoy a day together in a clean and joyous environment. Celebration Magazine always brings us great insight and history to the place we love. Yet, as his brother Roy was so adamant to proclaim – it isn’t “Disney World” it is “Walt Disney” World. So Issue #10 is the most fitting and obvious winner to me. I love #5 it’s beautiful pictureof the hat! I think that the Studios is the coolest most beautiful place to be at night! Ps my husband and I can’t wait to play the games he calls me at work and tells me when it gets there and he let’s me open , we go right to the games! Thanks for putting this out we love this mag! 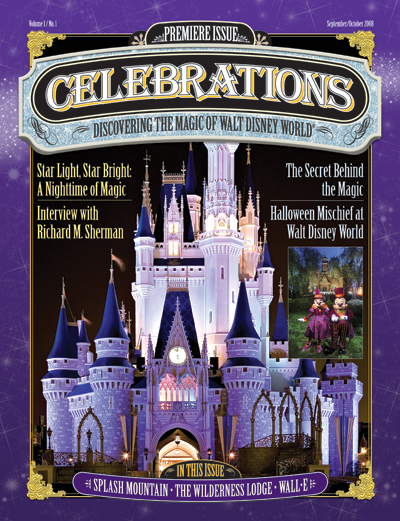 I love issue #2 and all the details about the holidays at WDW. I love it because it combines two of my favorite things, holidays and Disney World!!! They are all absolutely great though! Keep up the good work!!! I love all the issues, but Cinderella’s Castle cover photo is so beautiful. It brings back so many happy memories. That particular issue had an article about the Secret Behind the Magic which is fantastic. All the covers are great but I love issue 1, Cinderella’s Castle. It is a perfect shot and the perfect start to an awesome magazine. I love getting them in the mail, the help feed my addiction in between visits. I have read so many interesting things, so I already knew and some that I proabably never would have without this. Thank you Celebrations! Happy 2nd Anniversary, Heres to MANY more!!!! My favorite cover is of the Walt Disney World Railroad. With the simple tagline of All Aboard!, this cover beckons the reader to delve into the wonderful world of Disney trains, the most iconic of Disney attractions in ALL the Parks. The photographic skills are most evident here, as well. It is such a gorgeous shot of the oncoming locomotive, ready to pick up a load of Guests, who will eagerly await the discoveries around the next bend of the track. Plus, the magazine cover hints of the fun of Davy Crockett AND Body Wars, so that’s a BONUS! Thanks, Tim & Lou for the wonderful magazine you two have created for us Disney fans. It truly is an awesome thing! My favorite is the premiere issue with Cinderella’s Castle. To me, that emobides all the magic and wonder of Disney. The castle lures me down Main Street on every single visit and seeing the castle lit at night…well it never gets old. And, I cry every time I see the castle. Without fail. What else and where else for me but The Haunted Mansion. After all, home is where your hearse is. I have been an avid fanatic when it comes to the 999 happy haunts and their home. I took my daughter on her first time to WDW. This was a very difficult decision. All of the images are GREAT and have different meanings, even back to the opening of WDW. However, I picked issue #1 and the castle. When you think of WDW, you think of the castle. It’s something everyone *MUST* see when they go, whether it’s a first trip or 1,000th trip. And this is an exceptional photo of an exceptional icon. Thanks for all the great photos, articles, and all your hard work! 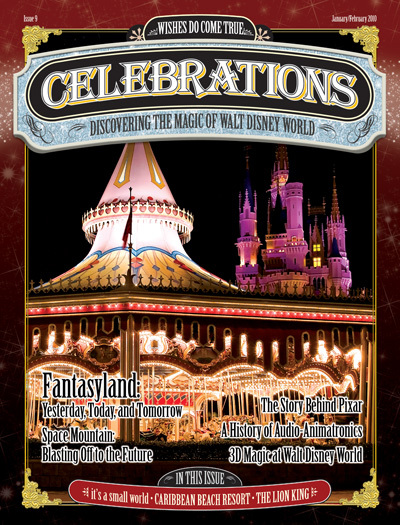 My favorite cover is issue 1~ the premier issue~ Cinderella’s Castle is the perfect image of the magic of Walt Disney World~ I love my subscription to Celebrations Magazine! I chose The WDW Railroad cover and believe me, it was not an easy choice because I adore them all!! To me, the trains are as much an icon as the Castle. Growing up and spending the first 40+ yrs of my life in Southern California, I have fond memories of riding the Disneyland trains. Now living on the East Coast, I go to WDW as much as possible. I love spending time in the DVC Villas at Wilderness Lodge’s Carolwood Pacific Railroad Room and I’m looking forward to taking the Behind the Magic of the Steam Trains tour in November! Thank you to everyone involved in the production of Celebrations! May you continue publishing the most beautful magazine ever for many years to come! Congratulations and Happy 2nd Birthday!! I have to say that I absolutely love EVERY cover issue. That said, I voted for the first issue, not because of Cinderella Castle, but because I was so very excited to finally have a magazine dedicated to the place we all love! I remember seeing the “postcards” at Lou’s table at MagicMeets. I got home that night and put my name on the pre-order list and anxiously awaited the first issue. I’ve loved every issue since!! Hello, I just want to say thank you for all the issues I love my subscription. I choose issue 1 Cinderella Castle. The reason for that is that it was my very first visit on my very first time to WDW. My trip with my mom & aunt back in 1980. I love the interview with Richard M Sherman was amazing. It was like sitting there talking to him personally. For the magazine I love all the articles they are so informative. First hand information, that a Disney fan wants to read. And a up & coming Disney fan to learn about Disney. Its history & vacation planning all in one. Thank you Lou & Tim & all the other authors of articles. Althought Cinderella Castle is classic Disney, my favorite has to be the Flower & Garden Festival! That is an absolutely beautiful photo that shows the true beauty of the festival and its relevance to a Disney fan with Cinderella’s carriage. Keep up the good work! I voted for the picture of Cinderella’s Castle. The image of the castle always brings back great memories of when I was younger and visited the Disney parks with my parents. Nothing brings back as many memories as looking at a Cinderella’s castle. I chose the most recent issue # 13 with The Main Street Electrical Parade. Pete’s Dragon was always a childhood favorite of mine and I remember when I was younger seeing video and pictures of Walt Disney World and the Main Street Electrical Parade. I remember thinking how awesome the float of Elliot looked and hoping that one day I would be able to see the parade and visit Walt Disney World. Now as an adult who never made it in time to see that parade (since every trip I have been on it was always Spectromagic), I could not be more elated that this October 2nd I will be in WDW and I will finally get to see The Main Street Electrical Parade! When I saw this most recent cover, I felt such an overwhelming happiness. Thanks for all that you do! I love the Haunted Mansion, it is the best ride in my opinion, just the memories I have of it as a kid and how they stuck with me all these years. When I saw the cover photo of this issue, it was great, the lighting was perfect and gave the Haunted Mansion, that look of a true haunted mansion. Keep up the good work and I look forward to each issue. I love The Illuminations issue! Issue 1. Seeing the castle gives me that “I’m finally back” feeling. And the quality of the magazine was outstanding. Love them all, but there us just ‘something’ about seeing the castle. The first issue! Cinderella Castle is such an icon of Disney magic and the cover captures that so well! 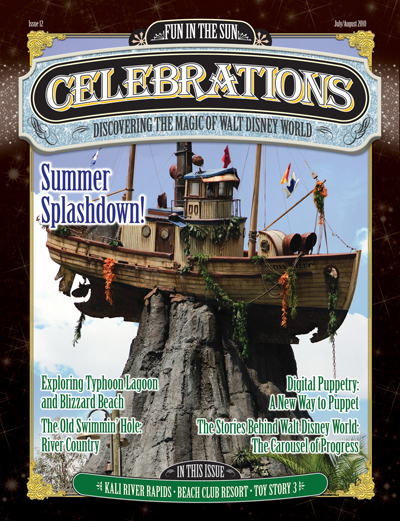 Of course I am partial to the first Celebrations issue because it was the start of what has become our favorite, and most anticipated, magazine subscription (both Disney and non-Disney). Thank you for allowing us to share your love of the magic!!! Illuminations – quintessential Disney. The music always transports me straight to Epcot and I never tire of it! Typhoon Lagoon is the coolest shot! Had to pick the first issue’s cover with Cinderella’s Castle! The castle represents all of the magic of Disney for me. Whenever we visit Disney I always feel the magic the most when we get to Magic Kingdom and I see the castle! Thanks for a great magazine-I just ordered all of the back issues that are available! HM! One of my favorites, ever since my first visit to DL in 1967. I picked issue 1, That picture shows the most well known icon of Disney and it is usually the first thing I see when I visit Wdw. I chose the MSEP as my favorite because this summer was the first time that my children got to see the parade and Elliot was their grandma’s favorite, so this cover has a very emotional connection with my family. The Haunted Mansion!!! Why?? Because it’s one of my family’s favorites, and seeing that picture on the cover brings all the memories of us waiting in line and waiting for Leota’s eyes to open and head to ‘pop out’ of the gravestone…of the time the Cast Member totally scared the you-know-what out of my 12 yr old daughter at the end of the ‘stretching room’ portion of the attraction, and we laughed about it for the whole day! Because, thanks to Lou, we just want the Doom Buggy to SLOW DOWN so we can see all of the details he has taught us to look for!! (Lou, I still can’t find the teapot pouring tea…) Because we ALWAYS look for Mr. Toad in the cemetary on the way out, though my kids never got to ride on Mr. Toad’s attraction…. it may not bring tears to my eyes the way that the Magic Kingdom Welcome Song does, but it will always hold a special place in my heart. LOVE the Haunted Mansion, love the picture and article, thanks guys! Had to pick the terrific shot of Cinderalla’s Castle. All the magic for me seems to be centered around the castle. Keep up the great work and keep Celebrations Mag coming! I love them all but I voted for Illuminations because that is my favorite firework show. Keep up the great work and Happy Anniversary. This was such a hard decisionâ€¦ but for me, it has to be Cinderella’s Castle! My mother loves telling the story about our first visit to Walt Disney World in 1971 with my potty training incentive: “Only big girls who donâ€™t wear diapers get to see Mickey Mouse.” 🙂 The pictures I have from the years before EPCOT opened with my Mom and Dad are priceless â€“ especially since my Dad passed away 20 years ago. IllumiNations all the way! That was a hard picture to take and it is my favorite fireworks show in WDW! I just the lighting on the cover of issue 9. It really looks ethereal which is just so appropriate for Fantasyland. The railroad is one of my first memories, from coming to the park as a small child in its first year of 1971. It has been a constant throughout the years as I have introduced my children to the Disney magic. The first thing we do every time is take a ride around the park… how clearly I can hear the conductors deep and melodious voice in my mind – and no eatin, smokin or sleepin… I badly miss being able to take regular trips to Disney; circumstances now do not allow it. But I can still enjoy other people’s excitement and Lou’s devotion to all things Disney via podcast and boards. I am new to Celebrations magazine, but I look forward to seeing my beloved World through this medium too. Thanks for all you do to help us feel lalmost like we are with you in our favorite place on earth, even when we are so far away. Good luck to everyone, and Remember the Magic. For me, like so many of us Cinderella Castle IS Walt Disney World. From the first time I saw it (1978 maybe? I was 9 or 10 years old) I knew I was in a special place. Magic Kingdom is always my first park on any Disney vacation, and the first glimpse of the castle STILL takes my breath away all these years later. The photo on the cover of that issue is spectatular! Lou and Tim you guys have done an incredible job worthy of something that would bear the Disney name. Your magazine brings the dose of Disney my family and I need at home, so for that we thank you. I think Walt would be proud of what you have created. And Lou? Keep moving forward!!! I love Hollywood Studios at night, great atmosphere! I haven’t received my copy yet, but I had to vote for the cover with Pete’s Dragon (ELP). Since the parade moved to DCA from DL, it hasn’t run the last umpteen years we’ve been there (late winter/early spring). Then we finally get to DLR this summer with ABD, and the parade is moved to the MK. Then we were told it would only run there through the summer, and we always go to WDW in December! Was thinking we’d never see it again. I feel sorry for California losing it, but so glad it’s still going to be at the MK for awhile! Looking forward to your article about it. Oh! And thanks guys, all of you, for the best magazine ever!! I vote for Issue #5. I do love the Flower and Garden Festival. It’s such a lovely time to visit Walt Disney World. But I choose this issue because the colors and so crisp and inviting. The above comment should have said Issue #4!!! I love that Main Street Electrical Parade has come back to WDW! And having Elliot on the cover makes it “the one” for me. I remember the parade from when I was little and most of all Elliot! It was the “WOW” moment for me back then. For a moment I felt it was real and he came to life in the middle of the parade. Seeing it now brings back all thoes memories. Thanks for all the hard work that goes into Celebrations magazine! Our family really does enjoy it and we can’t wait to see the next issue. I voted for Fantasyland. I have such wonderful memories of Fantasyland during my first visit (2 years ago) after the sun went down. The whole feeling and atmosphere of this land changed with the lights from the attractions and the Castle lit up with the different colors over our heads. This cover takes me back to that moment. I totally understand what Lou meant when he said it was hard to choose. It was relatively easy for me to narrow it down to 3-4 magazine covers, but today when I received Issue #13 with Elliot’s float from the Main Street Electrical Parade on the cover my decision was clear. I vaguely remember seeing the Main Street Electrical parade for the first time when I was a child when it was touring at WDW. Elliot’s float has always been my favorite float out of all the parades as it’s the only distinct float that means something special to me. I used to ask my parents where Elliot was while watching SpectroMagic as I was too young to realize there were two different electrical light parades during my childhood! Even though today I prefer SpectroMagic over the Main Street Electrical Parade, seeing Elliot this summer while watching it during Summer Nighttastic as a twenty five year old brought back many fond childhood memories. I went with the #1 because I felt like it set the standard for the magazine right out of the gate. Sure, Cinderella’s Castle is the easy wienie to feature and 9 times out of 10, a publication is going to go that route. But I felt the quality and look of the image, in the structure of the magazine’s design, really jumped out at the reader and announced Celebrations to the reading public. This wasn’t a magazine that was going to feature cookie cutter camera angles. It’s a magazine written by Disney fans, and photographed by them as well. The covers since then have been equally as inspired, and all seem to have descended from that great opening shot. I Have to say, so far The Typhoon Lagoon Cover has been my favorite! It is the freshest, with open skys..but there is no doubt where we are headed! I Love the water parks and miss River country. Every issue is a delight of color and surprise…but this one, I had to read every scrap before I could put it down…Thanks to your cover design. And thanks to you guys for giving those of us that don’t make it to our “HOME” but once a year or so a good “letter from home”! I voted for the Haunted Mansion… I have been going to Disney World my whole life and now I have my 4 yr old Alice and she has been 4 times already. Our fave ride is HM, out of all the Magazine covers it reflects our visits the most. Alice is Autistic and suffers from Megacephaly, a head condition which causes many issues for her. The other covers show amazing features of Disney, but for Alice, the castle is just for looking, the parades are too loud, the fireworks are too loud and hurts her sensitive eyes… the HM’s sites and sounds are actually quite soothing, everything is at a viewable distance and nothing startles her. We have years of memories with the HM and I know she will in the future… so I voted for HM and I know she would too! I chose the Tomorrowland cover. I chose this one because the brightness of the colors are amazing! The reds are like rubies and the yellows are like sunflowers. We don’t get this kind of quality photos with other magazines! Issue #3 I have to say would be my fav if I had to pick just one. I think the fact that Walt Disney loved everything about the future and space makes me think of him every time I walk into Tomorrowland at Walt Disney World. It is my favorite place to be when evening comes around. The Imagineers did such an amazing job with the lighting! It is amazing to be there at night! Also, because my very, very favorite attraction on property is located there! The Carousel of Progress!! Even though I never met Walt in person, growing up a child in the 60’s I saw him every Sunday night on television. This part of the park reminds me of him more than any of the other lands. It’s the first thing I hear walking up to the Magic Kingdom. When I walk under the tracks into the MK I know I’m where I should be! I was talking about the WDW Railroad, sorry about that! The Haunter Mansion cover is my absolute favorite. It just captures the mood of the Mansion so well, and it reminds of all the fun I had during the Not So Scary Halloween Party. Now I know it’s not everyone’s favourite view but I love the photo of the DHS hat on the cover of issue 5. I’m not a fan of the structure until it goes dark. Lit up it is amazingly beautiful, with the deep blue of the hat, the white-silver looking moons and stars, and the glittering gold surrounding it. Also I just loved that issue; the Main Street Windows are one of my favourite things to look and study, with all their history and meaning; and DHS was the first park I ever went to giving it an even special place on my bookshelf. I only have the last 2 issues and LOVE it!! What a way to keep the magic alive! i just ordered the back issue of the WDW Railroad issue (#10 I think) and i can already tell you THAT gets my vote! I am..well a grown adult with a little boy and i still love to play with trains! What a great idea Walt had to have a train around the park!! Kind of like ALL the train sets every kid has played with, a train going around the outside!! The WDW Railroad was my son’s first train ride on his first visit this year!! What a way to start!!! My favorite cover and issue is the Main Street Electrical parade. I have so many fond memories of watching the parade with my family growing up, and I can’t wait to share it with my own kids. Also, I really liked the article on the Pop Century Resort because I would like to try a stay there, and it had a lot of good info. Of course the other reason I like the issue is because it features my first article as a guest writer on Vinylmation! Even thought the Castle isn’t my absolute favorite, I still like the first issue due to the fact that it’s the one that started everything. I’m still a couple issues behind in my reading, but that just means I’ve always got something Disney to keep me happy. Honestly, I was torn. Issue #1 Cinderella Castle — LOVE that. The castle is such a symbolic icon. Seeing it just sends a rush of tranquility and excitement thru me simultaneously. After all, it is THE world-wide known icon for everything Disney. However, I chose the Typhoon Lagoon cover with Miss Tilly at the top of Mt. Gushmore. My husband and our 2 children are gargantuan Disney water parks fans. Seeing that cover just reminds me off all the times we’ve spent the day at Typhoon Lagoon and Blizzard Beach — and how the kids used to do the ‘little tyke’ attractions there, and how much they’ve grown and now attack the bigger slides and such. It just makes me think of all the fun and the happy times we had there creating memories. I just had to give it my vote. We LOVE this magazine! Please keep doing what you do so well. It is very much appreciated. And — HAPPY 2 YEAR ANNIVERSARY!! 🙂 Congrats! I voted for Issue 7, The Haunted Mansion. The Haunted Mansion is my favorite ride! It’s the best and will always continue to make me feel like a kid. My husband and I dress up as characters from the Haunted Mansion every year for Mikey’s Not So Scary Halloween Party. My husband is , one of the hitchhiking ghosts and I’m , the bride in the attic. We have a blast dressing up in these costumes every year and we always make a stop at the glorious Haunted Mansion! It’s always a fun ride, but when we are dressed in our costumes, it makes the ride even better! I love the Fantasyland cover. I love that you gave us the view of the Castle that is often overlooked and the carousel gives a small glimpse of the magic there. I find such peace looking at the icon of Magic Kingdom. In the stressful world we live in, I can look at the castle and feel great comfort. It was a perfect picture for your first issue! !